As I was think of writing this post I thought, crazy how with other games a big announcement is a new feature or a set of screenshot but with Madden, the big news leading up to the release is who is the cover athlete and what does the box art look like. 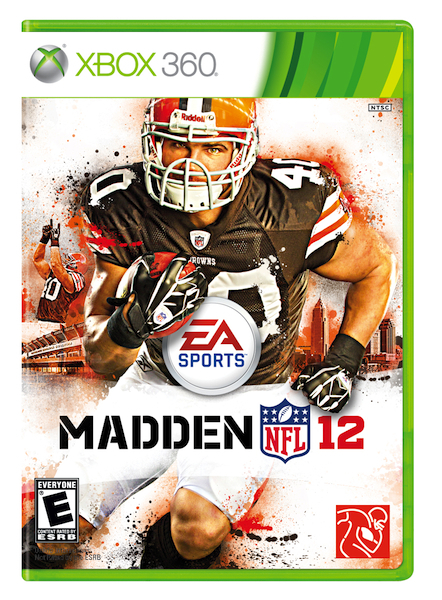 Madden is a series that sells itself but a good cover athlete doesn’t hurt. Cleveland Browns running back won the cover athlete challenge voted by fans, controversially beating dog-fighting champ/quarterback Michael VIck. Check out the cover below. But wait, there is more. Are you an ultimate Madden fan? That puny cover may not be the one you desire. 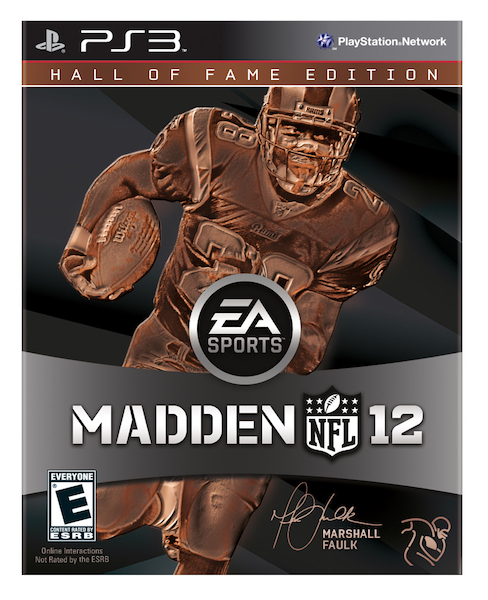 How about the limited Madden NFL 12 Hall of Fame Edition, featuring former St. Louis Rams running back Marshall Faulk on the cover. Only 125,000 copies will exist between both the PS3 and Xbox 360, EA suggest you pre-order now. This version will retail at $89.99 and will come with a few extra goodies. · Autographed Panini Card – Madden NFL and Panini, the world leader in published collectables, have teamed up to create the ultimate Madden NFL trading card featuring 2011 Pro Football Hall of Fame inductee, Marshall Faulk. Each copy of the Hall of Fame Edition will include one of four exclusive Marshall Faulk trading cards, each hand-signed by Faulk. One solid, 18k gold autographed card will be randomly inserted into one Xbox 360® and one PlayStation®3 copy of the Hall of Fame Edition. The lucky recipients of these two cards will have one of the most valuable cards in Panini history. · Exclusive Madden Ultimate Team Platinum Pack –The perfect combination of Madden NFL, fantasy football, and trading cards comes to life in Madden NFL Ultimate Team. The Hall of Fame Edition provides a Madden Ultimate Team experience like never before with the most prestigious Platinum Pack yet, featuring a combination of 13 NFL Hall of Famers and former Madden NFL cover athletes, including: Marshall Faulk, Barry Sanders, Jerry Rice, Rod Woodson, Eddie George, Michael Vick, Donovan McNabb, Ray Lewis, Shaun Alexander, Vince Young, Larry Fitzgerald, Troy Polamalu and Drew Brees. All cards feature ratings from each player’s most productive season in the NFL and are fully renewable with contract extensions, which is sure to make them some of the most sought after cards in Ultimate Team history.